Home→Uncategorized→Welcome! Come worship with us! 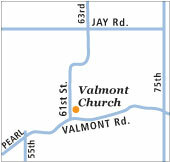 Education Hour – 9:00 a.m.
Fifth Sundays – 10:30 a.m.
You have a friend at Valmont!